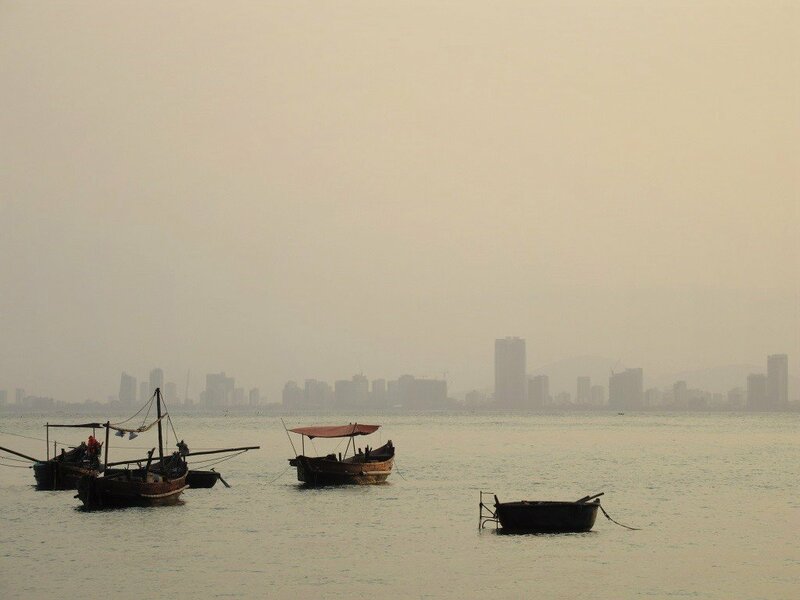 Every great city needs a great escape. In this respect, Danang is spoiled for choice. 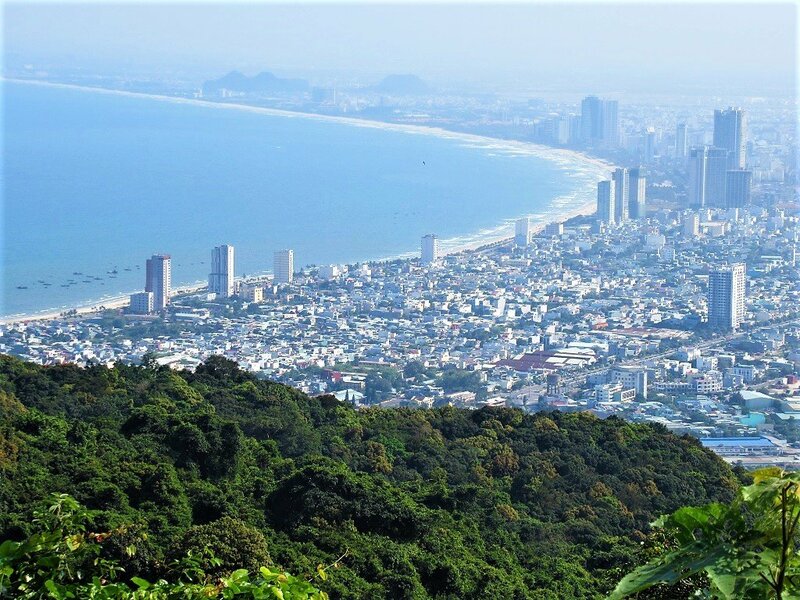 Not only does Danang have its wide, sandy beach to the east, the Hai Van Pass to the north, and the Troung Son Mountains to the west, it also has the Son Tra Peninsular, a mountainous headland blanketed in forest with beautiful roads rolling around its contours. 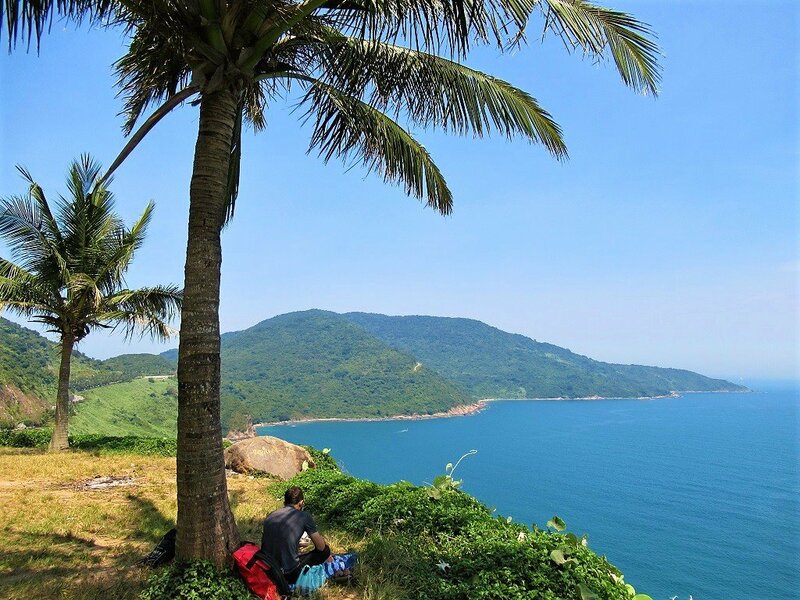 A mass of rugged, green land at the northern tip of Danang’s municipal beach, Son Tra Peninsular anchors the city to the ocean, but it also shields it from severe weather from the sea. 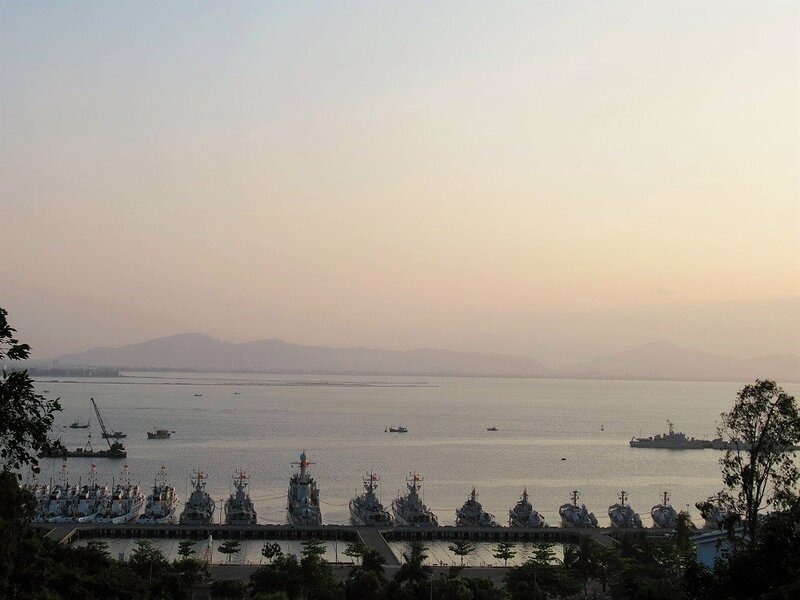 As Danang’s star rises – fast becoming the ‘Rio’ of Vietnam – Son Tra Peninsular checks the city’s urban sprawl and construction boom, as if to say, ‘Stop! Here the development ends: here be nature, here be mountains and forests, the call of macaques, cliffs and coves, centuries-old banyan trees, lofty mountain passes with majestic views, and sandy beaches untainted by concrete high-rises.’ A world in itself, the Son Tra Peninsular offers all of this and more. By far the best way to explore Son Tra is by motorbike. The roads are good, the distances short, but the rewards huge. In fact, this is one of the most scenic stretches of coast road anywhere in Vietnam. 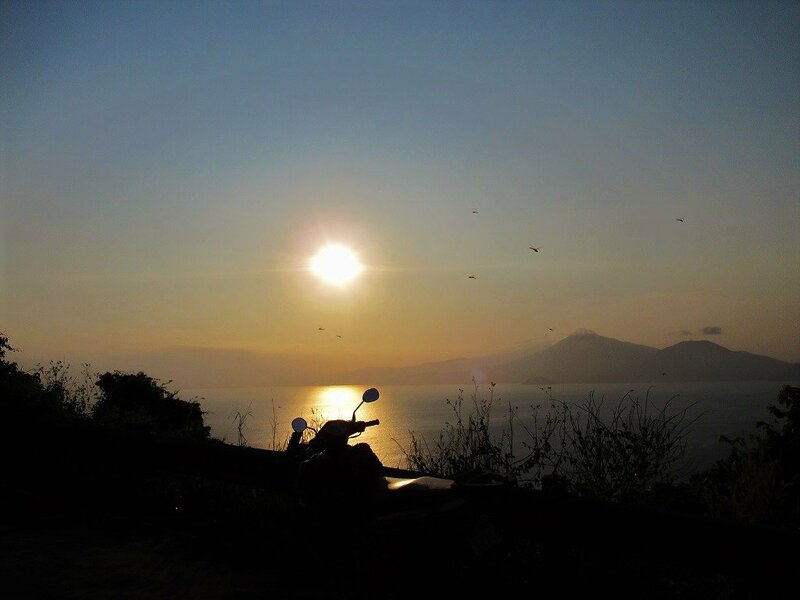 A day or two riding the swirling tarmac on Son Tra Peninsular is definitely one of the best things to do in Danang. Winding around the peninsular like jungle vines around the trunk of an old tropical tree, the road network on Son Tra is surprisingly extensive. 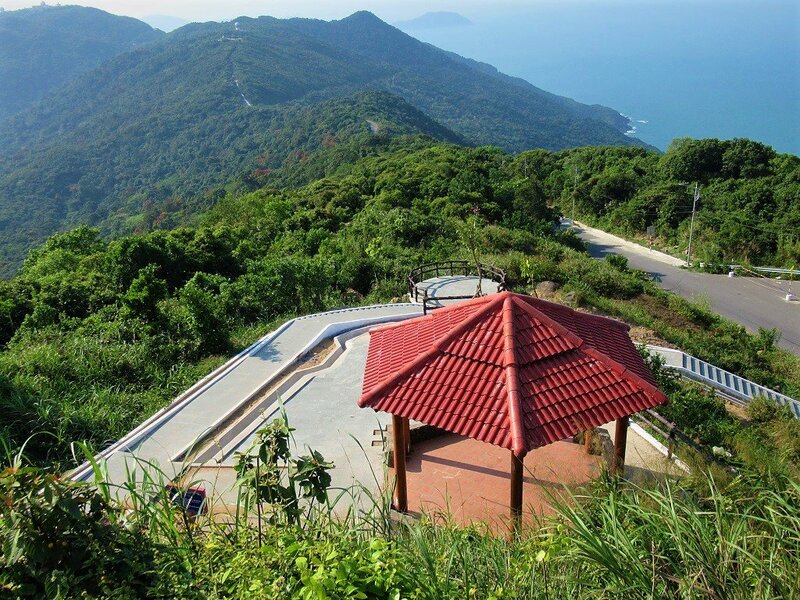 Mountains, coast and jungle are all accessible via the peninsular’s steep and meandering paved roads and concrete lanes. I’ve divided Son Tra’s roads into 3 routes (see the Contents below). However, I highly recommend riding all three of the routes on the peninsular, because they’re all fabulous in their own way. Traffic is light but it can get busy on weekends and public holidays. Although the distances are short it will take many hours to complete the routes because the scenery is so good. You can ride all three routes in one, fairly long, and pleasurable day. But it’s much better to spend a couple of days riding around the peninsular to really soak it all up. Make sure you rent a decent bike, because the gradient is very steep in places and some bikes might struggle, especially with a pillion. On my map I have colour-coded each of the three routes so that they’re easy to distinguish. In the guide below I’ve written a separate description for each of the three routes, including information about things to see and do, places to go, stay, and eat. The best time of year is March-September, when the weather is generally good; October-February can be wet, grey and windy. Routes & Transportation: As you’ll see from my map above, I’ve divided the roads on Son Tra Peninsular into three colour-coded routes, which you can piece together as you like: the Coastal Loop (blue line), the Inland Route (red line), and the Banyan Extension (purple line). All three routes are highly scenic, fairly easy to navigate (signage is good), and pleasant to ride. 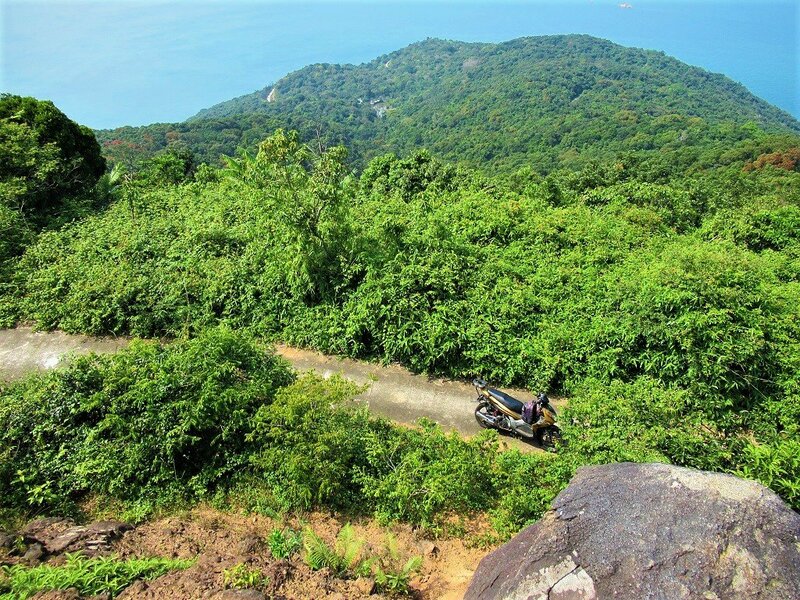 Although Son Tra Peninsular is ideal for exploring by motorbike, you could feasibly do it on a bicycle too, but it’d be a real challenge with all the steep ascents. Without your own wheels it’s not as fun, because you won’t have the freedom and independence to go where and when you please. 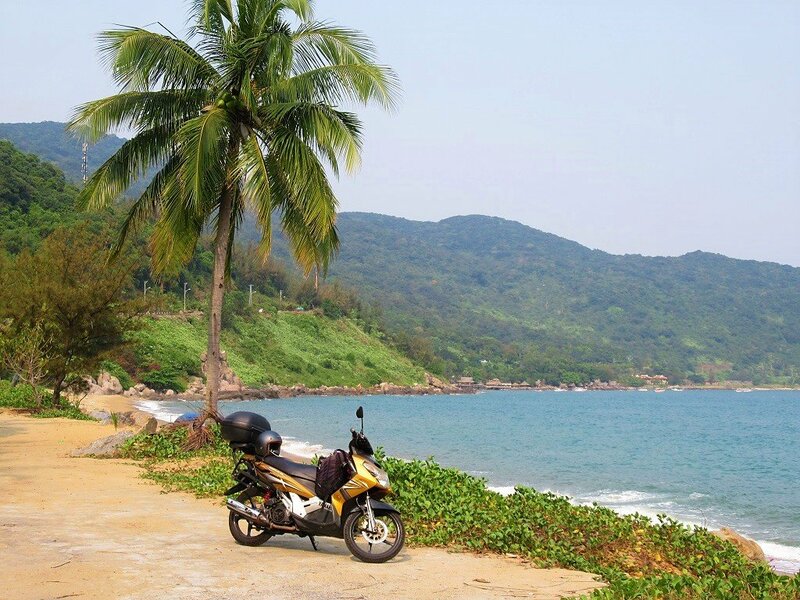 However, it’s still possible: You can hire a taxi or motorbike-taxi (Grab, for example), or rent a car and driver, to take you from Danang or Hoi An and around Son Tra for the day. But, of course, this will be relatively expensive. Danang & Son Tra: Danang is a great city with a great future – the world is starting to realize this now. But, as the city has made a name for itself, inevitably the population has swelled, visitor numbers have soared, construction has boomed, and the roads are increasingly congested. Son Tra Peninsular is the perfect quick fix antidote when Danang’s metropolitan appeal starts to wear off. Barely 5-10 minutes from downtown, and you’re in the forests, mountains, and beaches of Son Tra. There are Buddhist temples and shrines, high-end resorts and budget beach camping, seafood restaurants and cafes, gardens and museums, beaches and coves, jungles and wildlife, stunning ocean vistas and city views, peace and tranquility, sea breezes and fresh air. Environment & Nature: Trash, thankfully, appears to be under control on Son Tra Peninsular, and construction has been limited to a couple of high-end resorts, several hastily-built mid-range accommodations, a huge temple complex, and some seafood restaurants. However, there at least a couple of abandoned, half-built resort projects, and new developments planned for the future. But technically, Son Tra is a protected area. 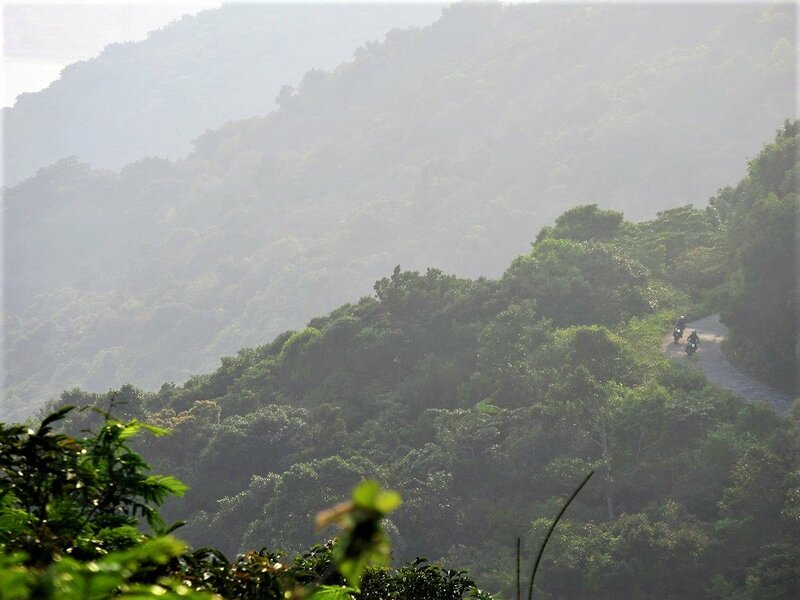 You will almost certainly see some wildlife, especially squirrels and macaques (at least I think they’re macaques), and maybe even the famous and endangered red-shanked douc langur. 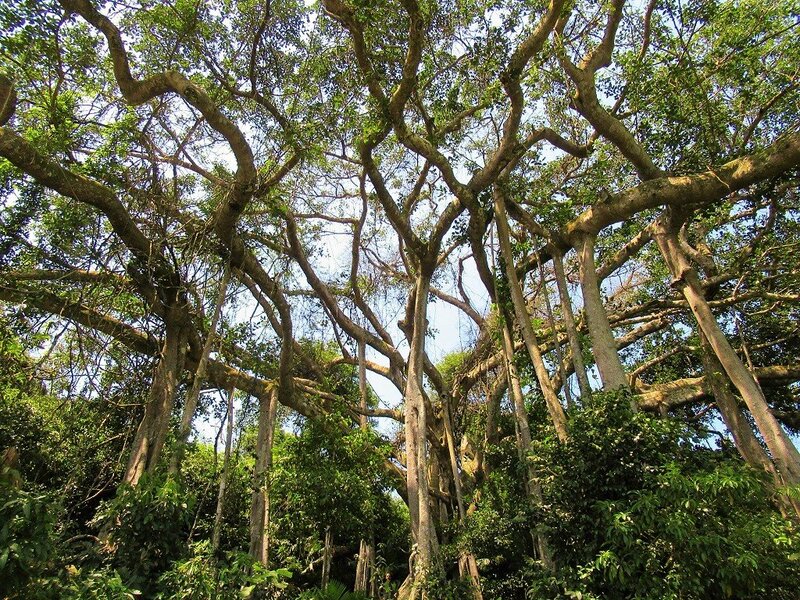 Exotic birds, butterflies and dragonflies are everywhere, and the jungles are full of giant, old, tropical trees. Safety & Traffic: Although traffic is generally very light (except on weekends and public holidays), the roads can still be dangerous if you’re not careful. On the narrow lanes, particularly in the north and east of the peninsular, there are some potholed sections and gravel in the corners which is treacherous and easy to skid on. The inland road is extremely steep and it doesn’t take much to lose control. Also, when hiking the pathways through the trees and down to the beaches, it’s very easy to slip and twist an ankle or worse. It might feel safe on the roads, but it’s imperative to ride cautiously. I saw dozens of foreign riders on Son Tra without helmets. This is a bad idea on many levels: Firstly, you’re breaking the law of the country in which you are a guest; Secondly, it’s dangerous (although, perhaps if you can’t be bothered to wear a helmet, you get what’s coming to you); Lastly, if you don’t wear a helmet, everyone will look at you and think you’re an idiot. Increasingly, Vietnamese people see foreigners breaking laws or behaving badly and, understandably, resent them for it. Don’t confirm and encourage this image of foreigners in Vietnam: wear your helmet. 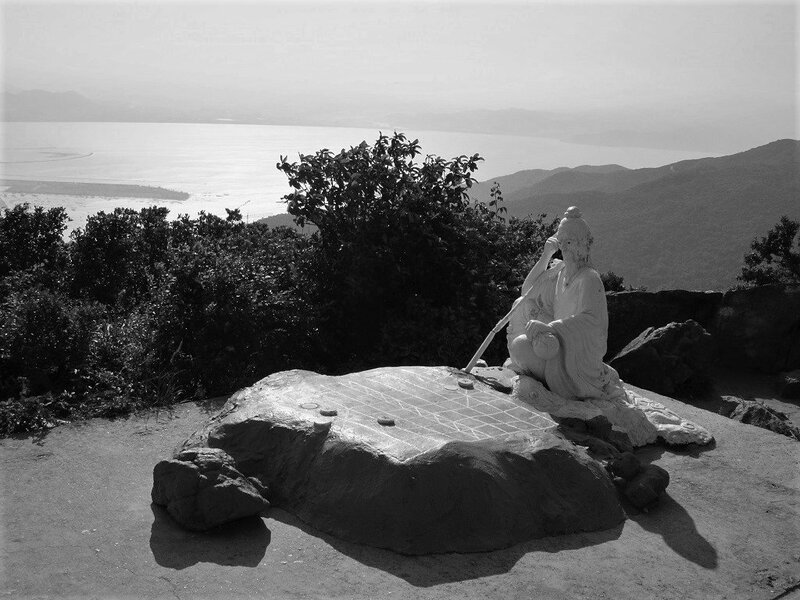 Son Tra was formerly referred to as Monkey Mountain, a name that was popular with Americans during the war. Indeed, Son Tra has long been of strategic importance as the entrance to one of Vietnam’s biggest ports and cities. For this reason, parts of the peninsular are still tightly controlled by the military and off-limits to visitors. I’ve marked such places on my map. Description & Places of Interest: I’ve written this description of the Coastal Loop going anti-clockwise, starting from the intersection of Le Duc Tho Street and QL14B. This is an excellent coastal route which circumnavigates the entire peninsular (with the exception of the Banyan Extension, see below). The Coastal Loop is easily completed in a day (it’s only 30km) and there are lots of swimming opportunities and things to see. As a general rule, the coast road in the south of the loop is wide, smooth, and in very good condition; but in the north it’s narrow, a bit bumpy here and there, but paved and very manageable. The south coast has some development, but the north coast is almost completely deserted. 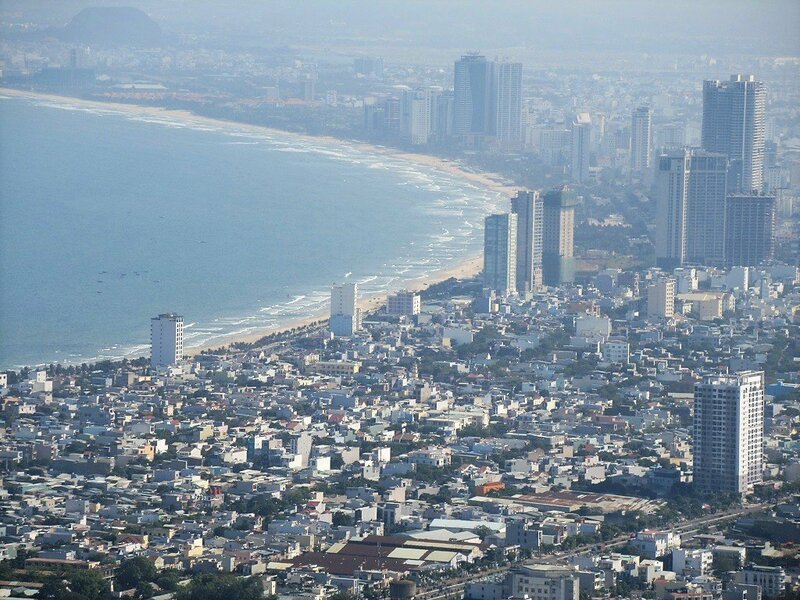 As Le Duc Tho Street heads east it meets Hoang Sa Street at the northern tip of Danang Beach. 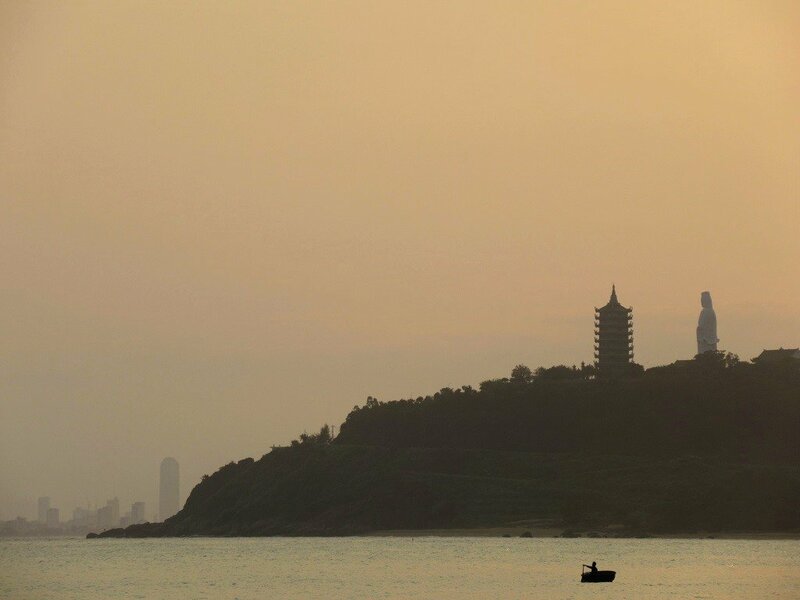 Here, the city’s high-rise hotels fade away, leaving only a collection of private villas, mini-hotels, seafood shacks, and old fishing homes. A small but picturesque fishing fleet clusters in the shallows, sheltering in the lee of the peninsular. 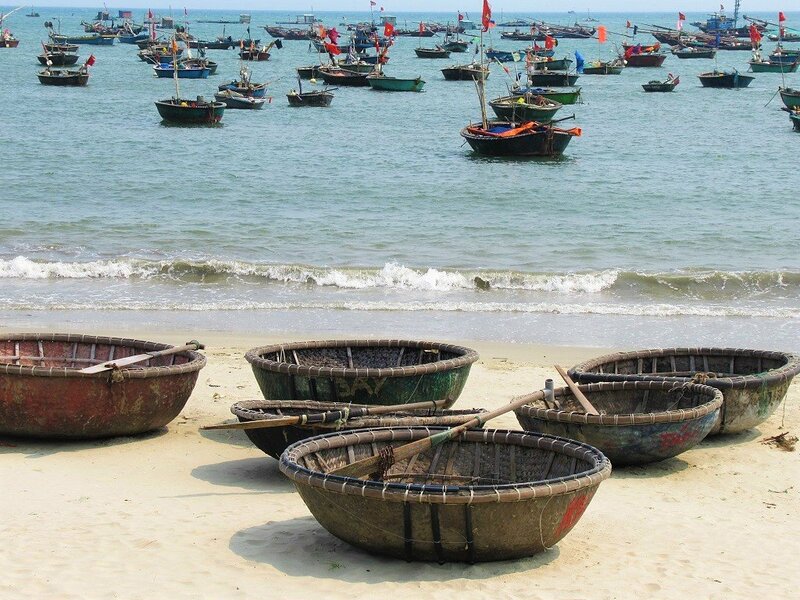 Dozens of woven coracles and wooden sampans ride the gentle surf, with Danang’s increasingly modern skyline behind. 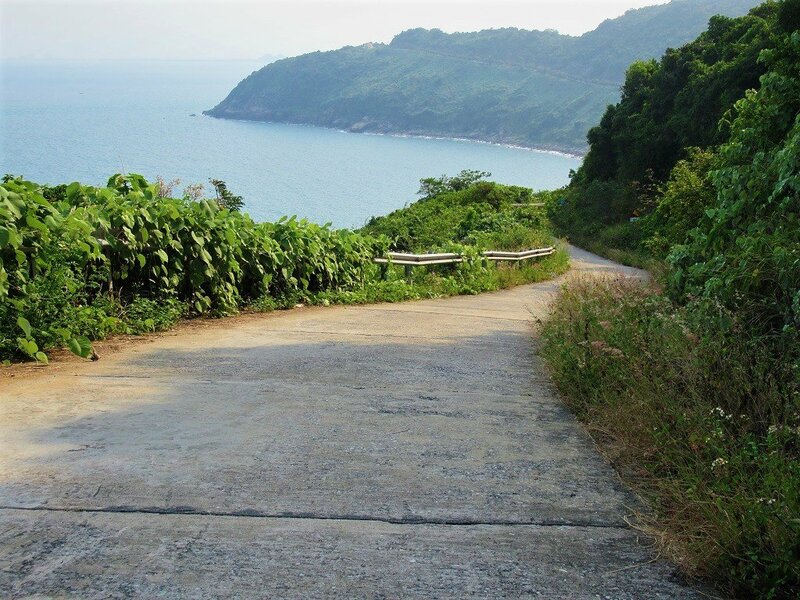 Hoang Sa Street is the name of the coastal road stretching all the way around the southern coast of the Son Tra Peninsular. At first, the road turns east, curling around a rocky bluff past a lake and a marina. After just a couple of minutes, the road twists inland, skirting an attractive casuarina-backed beach. It looks enticing, but the beach is currently off-limits: it looks as though it’s awaiting resort development. On the inland side of the road, a steep lane leads up to the Dong Kinh Museum. 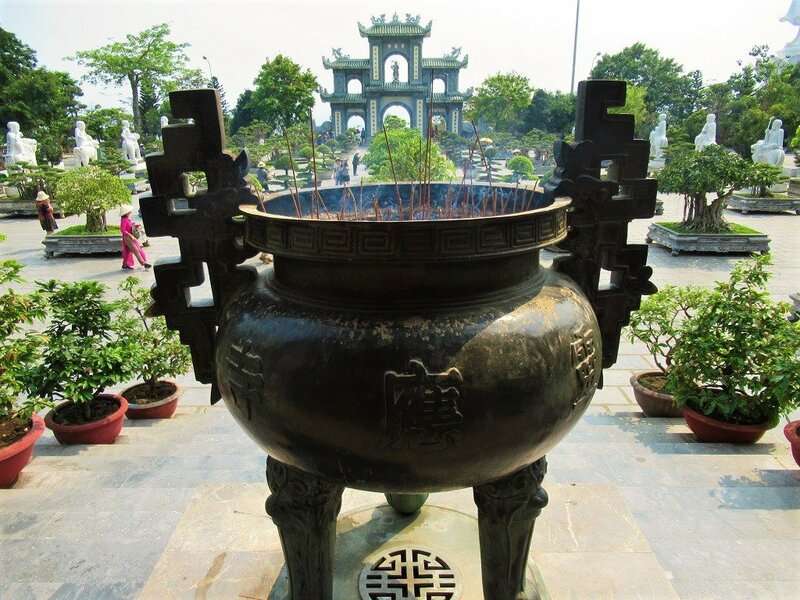 With a fascinating and striking gallery of ancient and traditional art and architecture dating back thousands of years, all displayed in an attractive garden setting, it’s worth stopping by this privately-owned museum for a visit if you have the time. Just beyond the museum, you’ll see the gigantic white head of Phật Bà Quan Âm (the Lady of Compassion) peaking above the trees. 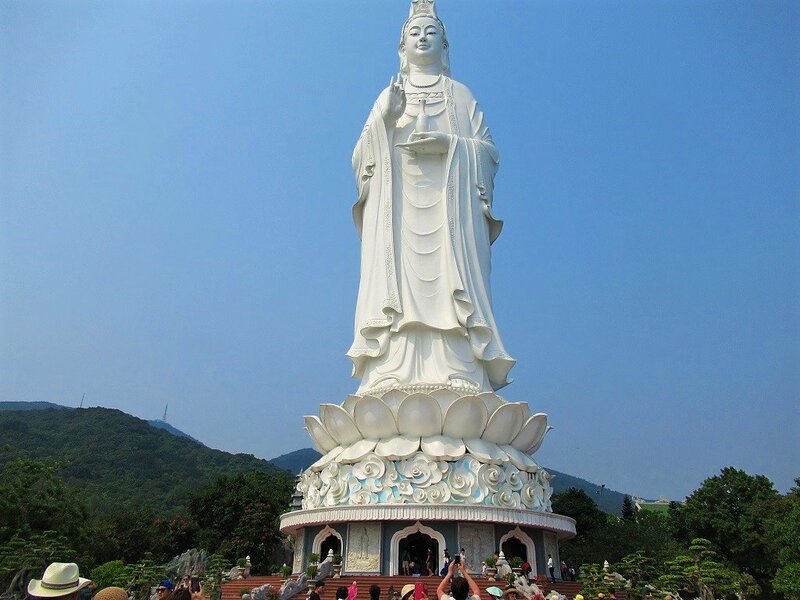 A colossal sculpture, the Lady of Compassion is a Buddhist Bodhisattva (like a saint or deity) and her statue is the focal point of the enormous Chùa Linh Ứng temple complex on the hills overlooking Danang Bay. Accessed via a wide and steep concrete road, the views are superb and the temple complex – dotted with fine sculptures, bronze incense burners, pretty antechambers, a tall, terraced tower, and lavishly decorated pagodas with courtyards filled with bonsai trees – is a compelling place to wander around for an hour or so. Note that you must take your shoes off to enter any of the structures, and if you’re wearing shorts of a sleeveless T-shirt, you will need to cover yourself with the robes provided at the temple entrances. It’s a very popular and busy attraction, but it’s still a very worthwhile place to visit. Entrance is free. Some refreshments are sold inside the complex. Continuing east along the coast road after the Chùa Linh Ứng temple, there are a series of good beaches and bays stretching all the way to Bai Da, near the southern tip of the peninsular. 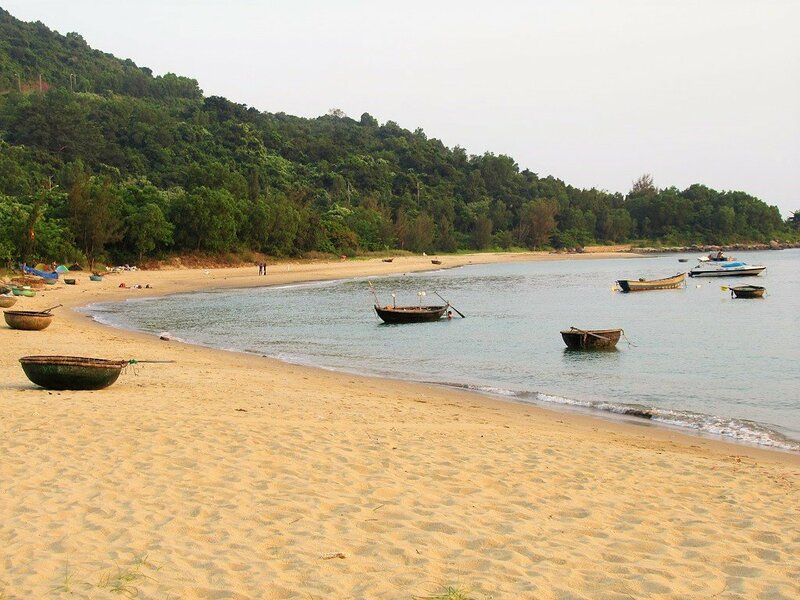 The most developed part of Son Tra, the south coast beaches are backed by jungled hills and great for swimming, watersports, seafood lunches, and general exploration. The road is wide and good, the riding easy and fun, and the views excellent. The beaches can get busy on weekends, but there’s usually only a trickle of daytrippers during the week. The first beach after the temple is Bai Cat, a beautiful, long strip of sand with the colossal statue of The Lady of Compassion watching over it. There’s what looks like an abandoned resort here and another one that also looks rather forlorn but is, in fact, active. Accessed by a steep lane from the main coast road, Bien Dong Resort (0236 392 4464) has a prime location at the centre of Bai Cat Beach. But despite having two swimming pools, a beach bar, and thatched beach huts, the complex as a whole is quite rundown. Even so, it’s not bad value for money if you get one of the cheaper garden view rooms for 700,000 (definitely try to bargain on a weekday). Even if you’re not staying here, you can ride down to the beach for a swim and a drink. 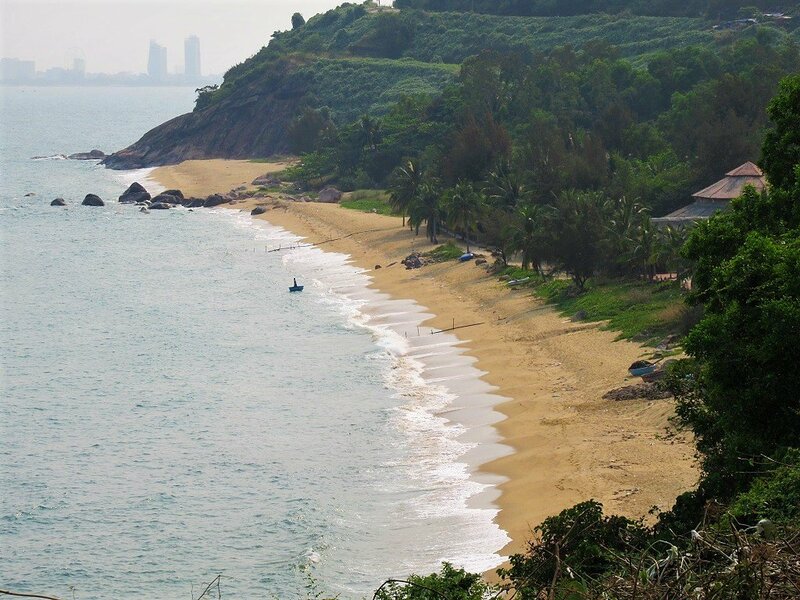 The other access point for Bai Cat Beach is at the southern end, where Hoang Da Son Tra is a shack by the roadside with a long pathway leading to the sand. The shack sells a few drinks (with excellent sea views) and you can even negotiate camping on the beach for the night. There are tents for hire and it only costs around 100,000vnd per night. However, it might be a bit tricky if you don’t speak any Vietnamese. Ask the staff in the shack and/or call Ms Châu: 0976 113 969. The next two bays have been developed to varying degrees. The first is Bai Rang Beach, where a series of at least three separate seafood restaurants, cafes, and beach bars line the sand and rocks. Ho Binh (090 510 1318), Bay Ban (090 357 5584), and Bien Dao (093 581 5811) all have access, via very steep pathways and steps, to a good bit of the beach. They’re all good enough for a lunch stop or a quick dip in the ocean and a fresh coconut, but they can all get pretty busy and have trash lying around. (You might also be able to camp here.) 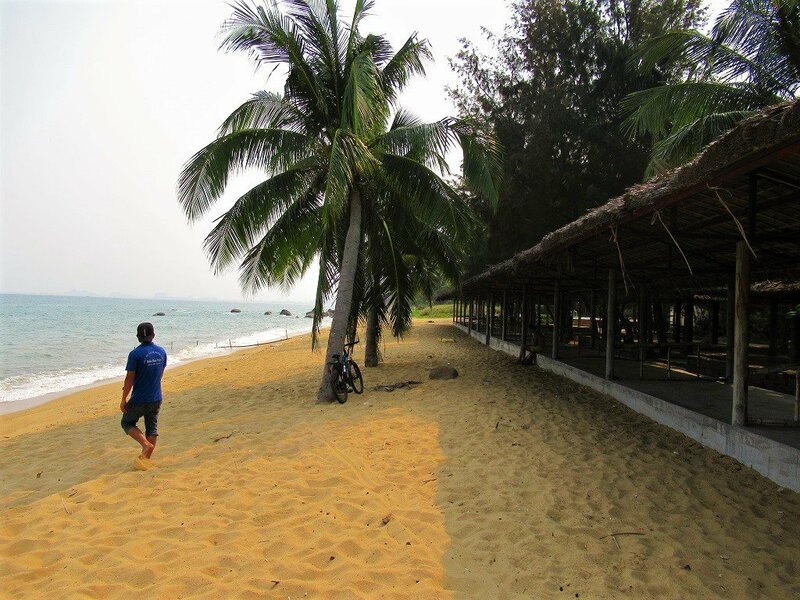 The next beach along is entirely taken up by Son Tra Resort & Spa, which is a nice collection of smart bungalows along the sand. Prices start at around $100 a night. Bai Nam is the last of the sandy beaches before the road rounds the cape and turns due north, and it’s my favourite of the south coast beaches. A brilliant strip of fine sand with a small cluster of picturesque fishing boats and coracles floating at one end, the swimming here is excellent and there’s not much trash around. 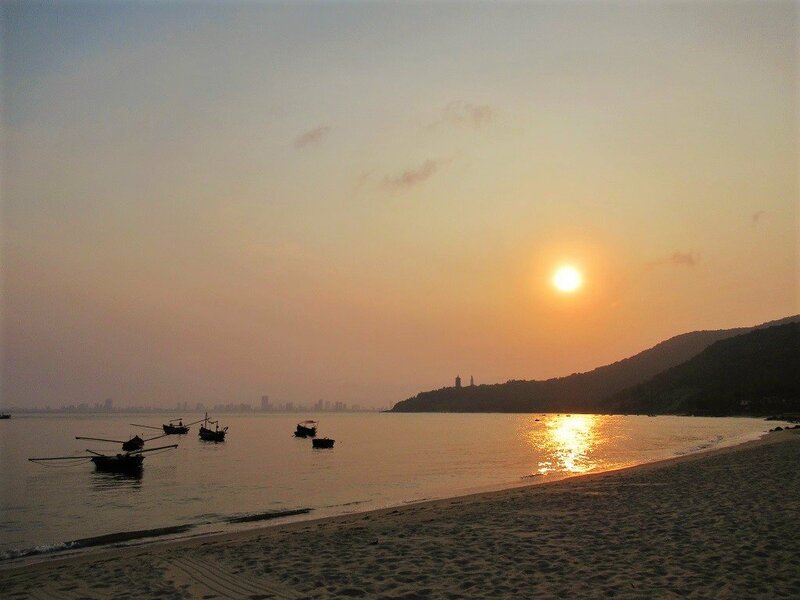 Bai Nam is generally very quiet, and it’s particularly good for a late afternoon swim, because it faces due west where you can watch the sun set over the ocean and behind Danang’s impressive skyline. 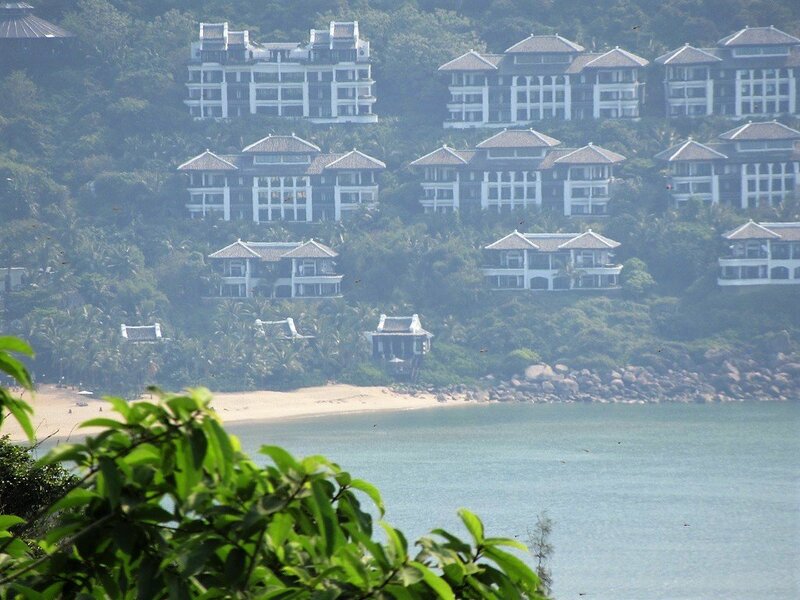 At the western end of Bai Nam there’s yet another abandoned resort project. But at the centre of the beach, Vườn Tôi (090 586 8535) offers some food and drink, and fishing and snorkeling excursions. They also allow camping on the beach here, but I was told it’s difficult for them to except foreign campers. Out in the bay, several floating restaurants serve fresh seafood. At the southern extreme of Bai Nam, Truong Ngoc (097 430 3709) has food and watersports – it’s based on the rocky shores of Bai Da. 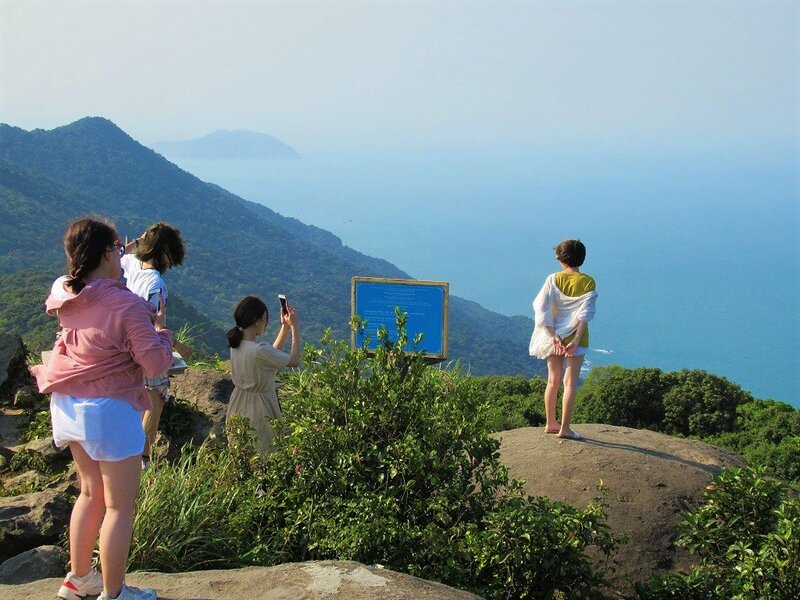 After rounding Mui Sung Cape, the coast road glides above the waves, opening up good viewing spots. Take some time to stop by the road and sit under a tree to admire the views over the cliffs and out the sea. The Hoang Sa coast road ends at the Bai Bac intersection. Turn left here, past the tennis courts, and then take a sharp right (due north). 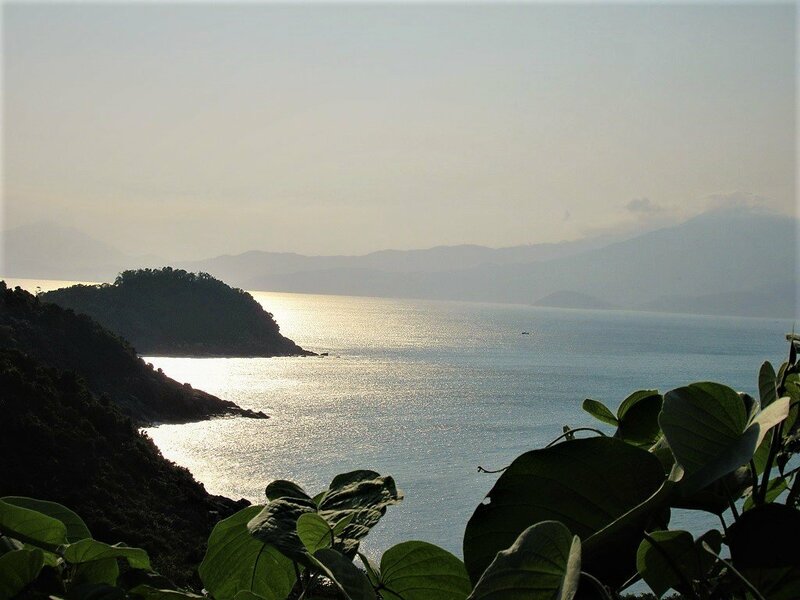 This road leads behind the ultra-luxurious Intercontinental Sun Peninsular Resort (which has the lovely Bai Bac Beach all to itself) and begins the northern section of the Coastal Loop (see below). 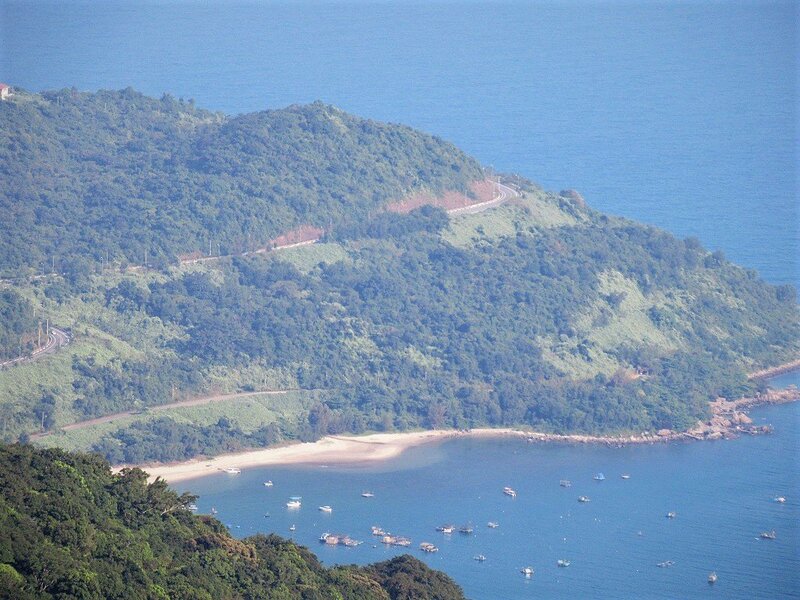 Description & Places of Interest: Once past the Intercontinental Resort, the northern coast road soars above the sea, slicing through dense jungle. This side of Son Tra Peninsular is remote, undeveloped, and very peaceful. The jungle canopy shimmers with life. There’s a good chance of seeing some wildlife darting out of the foliage and across the road, including primates, birds of prey, and squirrels. Although the beaches here aren’t really accessible – because they’re very rocky and far below the road – it’s a thrilling ride along a deserted, narrow, concrete-slab lane. When the road starts to wind due south, back in the direction of Danang, it runs high above the ocean. 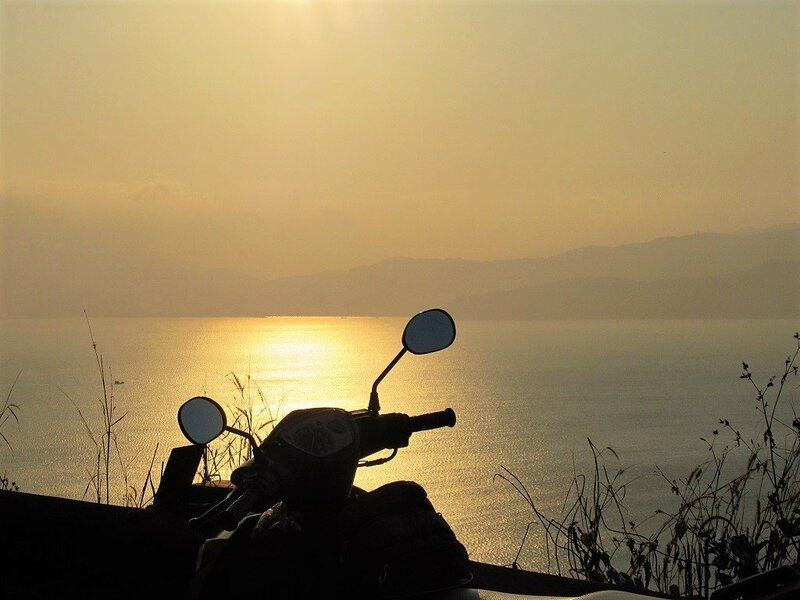 Empty and quiet, it’s perfect from 4pm onward, when the sun starts to set on Danang Bay, igniting the city’s high-rises and making silhouettes of the mountains of the Hai Van Pass. 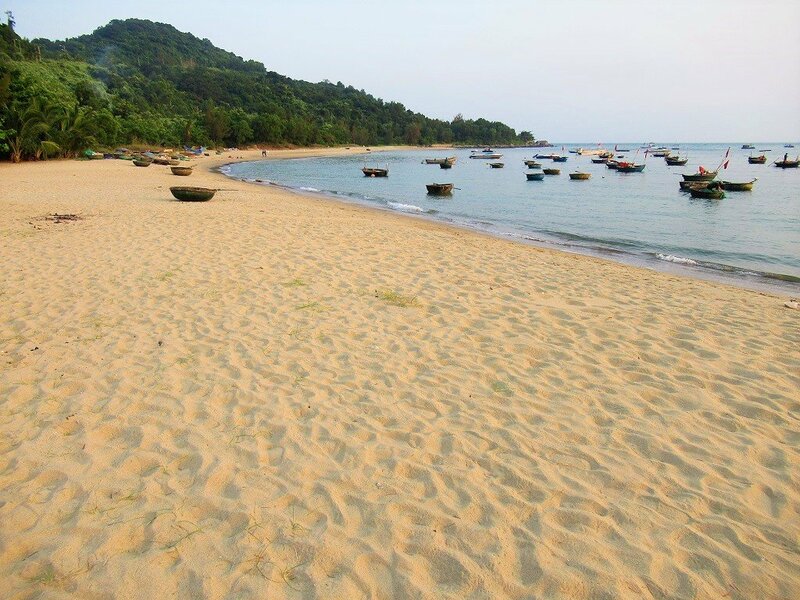 A lane leads down to the beaches of Bai Da and Cat Vang, both of which are lovely crescents of sand, dotted with large boulders and backed by jungle. 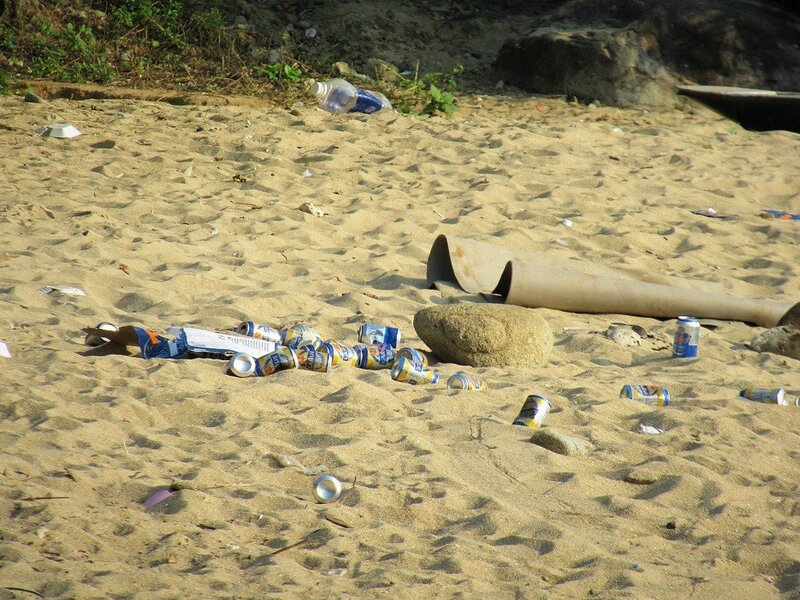 Very scenic and good for swimming, there is, however, quite a bit of picnic trash left behind by visitors. 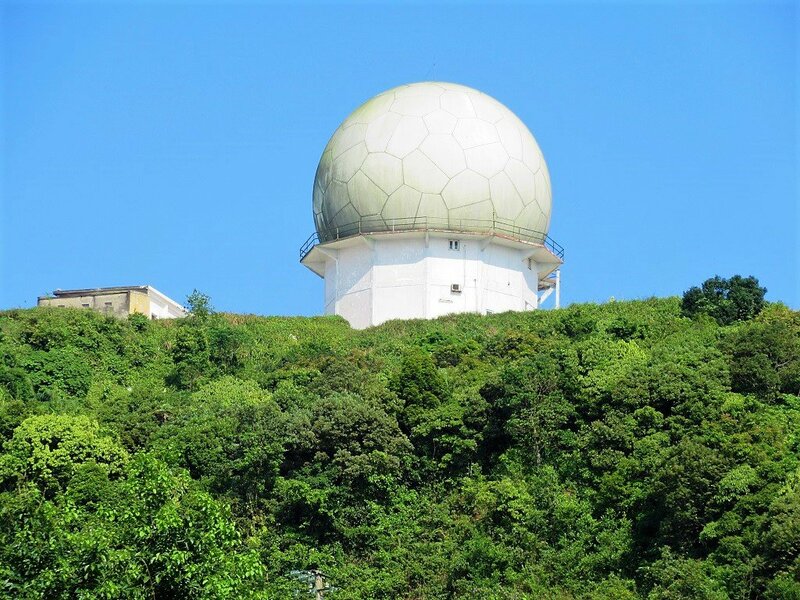 As the road continues south, hugging the mountainside above the sea, it reaches the naval base at Tien Sa. Turn right at a military check-point and steeply down to join Road QL14B (Yet Kieu Street). It’s worth turning right again at the main road and continuing to the western tip of the peninsular, where Tien Sa commercial port is located, as well as Tien Sa Lodge, which offers fairly soulless but comfortable, good-value rooms with sea views and a beach. Also near the beach here is the fascinating Y Pha Nho Cemetery. This colonial graveyard holds the tombs of 30 French and Spanish soldiers who died here in 1858, during France’s first attempt at landing and conquering Vietnamese mainland territory. The French were defeated in Danang, and shifted their focus south, to Saigon, which they took and gradually gained control over most of the rest of Vietnamese territory, including Danang. After a visit to the cemetery, turn back on Road QL14B to the intersection with Le Duc Tho Street, thus completing the Coastal Loop. Description & Places of Interest: In many ways, the Inland Route is the most spectacular of the roads around Son Tra Peninsular. This is because it leads very steeply up the mountainsides, cresting and following a ridge, and curling all the way to stunning peaks and viewing platforms with immense vistas. At only around 18km in total, it’s a relatively short route, but the scenery is so good that you’ll probably spend an hour or two riding it. I’ve written the following description going from west to east, but you can ride the Inland Route is either direction, and there are several access roads connecting it with the Coastal Loop. 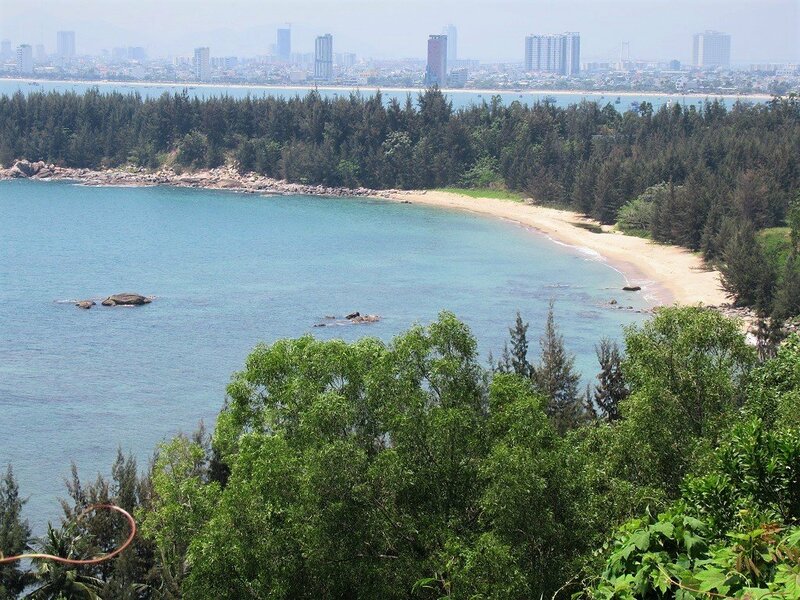 Starting at the northern tip of Danang’s long beach, take Le Van Luong Street due north. It’s not long at all before the road starts to twist and turn. 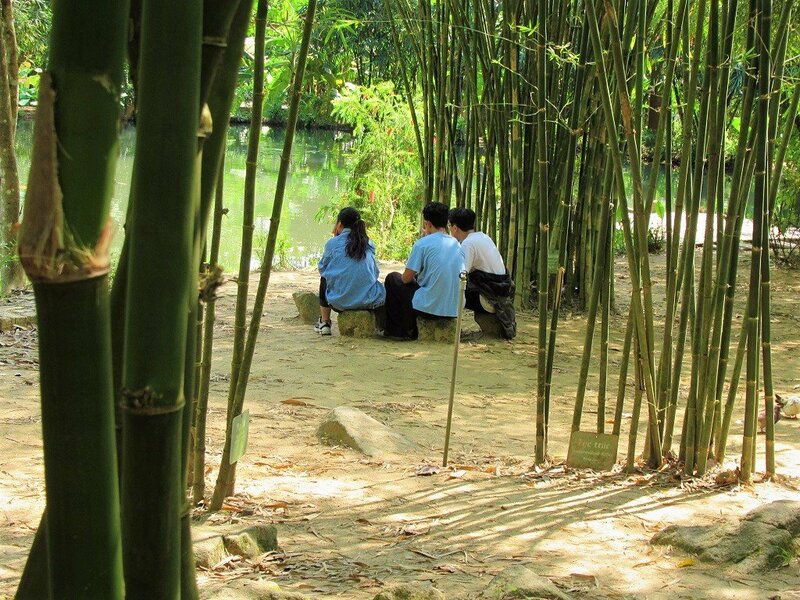 After a short ascent, Vườn Tre Bamboo Garden is on your right. (The entrance is easy to miss: look out for a bamboo gate in the hedgerow.) A peaceful, contemplative place filled with the sounds of trickling water from mountain streams and cicadas in the brush, Vườn Tre is lovely for a short break with a coffee or a book. The garden is dotted with clumps of different kinds of bamboo with signs identifying each one. There’s a pond full of large fish, and lots of benches and chairs to sit in the shade and while away an hour or so,. Pathways lead through the bamboo groves, between fruit trees, and over rocky streams where little Buddhist shrines decorate the scene. Moving east along the inland road, a dramatically undulating section passes by an old helicopter landing pad and another link road to the Coastal Loop, before climbing extremely steeply to Ban Co Peak viewing platform. As high as the road goes (not including the restricted access roads), Ban Co Peak is reached via a flight of winding steps up to a rocky summit where the views are staggering. Looking over the jungled spine of Son Tra Peninsular, out to the East Sea where the Cham Islands look tiny in the vast ocean, and down over the entire length of the long beach stretching from Danang’s impressive skyline past the Marble Mountains to Hoi An, it’s difficult to comprehend the scale of the view you’re seeing. The peak is windy, fresh and cool. The only adornments are viewing gazebos and an incongruous, but nonetheless attractive, sculpture of Confucius leaning on his staff pondering his move in a game of chess. Just beyond Ban Co, a dirt lane leads to a clearing overlooking Danang, which, apart from being a good view point, is a parasailing launch site. After this the road surface deteriorates before an intersection, where your only choice is to descend, because the other two lanes are restricted access. 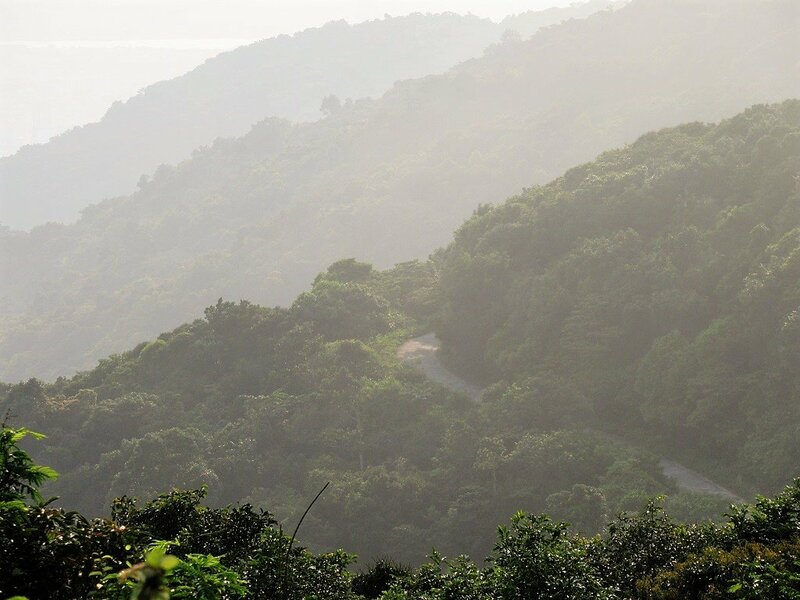 From Ban Co Peak, the road narrows for a 7km descent all the way down the mountains to the Bai Bac intersection, near the Intercontinental Resort. 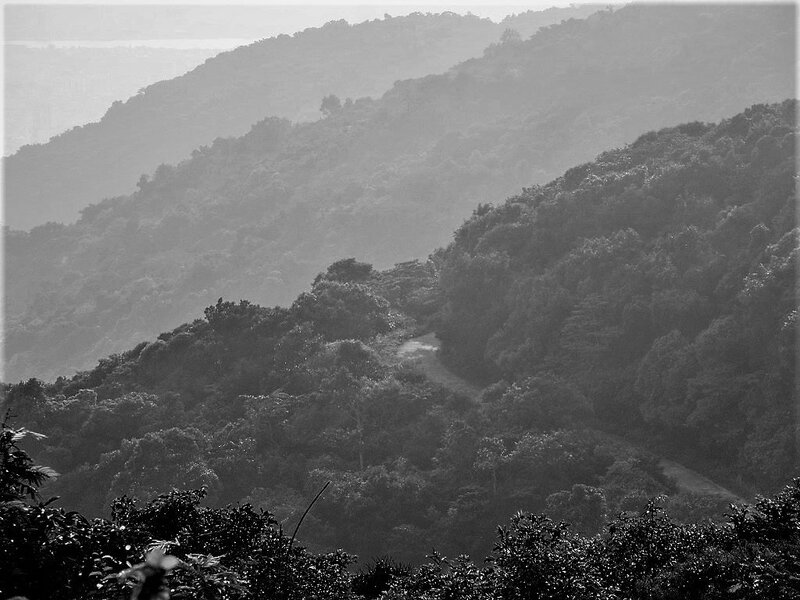 Known as Monkey Pass, this is probably the steepest road on the peninsular. It’s in decent condition and very quiet, but be careful in the tight, blind corners. The ride is spectacular, very green, lofty, and fresh. A slip road halfway down leads to a dead-end but with good views. At the Bai Bac intersection you can link up with the Coastal Loop going north or south, or the Banyan Extension route going east. Description & Places of Interest: This route covers the densely forested easternmost section of the Son Tra Peninsular. Remote and beautiful, I’ve called this route the Banyan Extension, because both of the lanes in this area ultimately end at grand, old banyan trees that have stood here for many hundreds of years. Spreading east of the Bai Bac intersection, this route is a scenic extension (it’s only 10km) to the Coastal Loop and the Inland Route. By turning due east at the Bai Bac intersection, a narrow, highly scenic, concrete-slab lane glides through lush foliage above a high cliff. 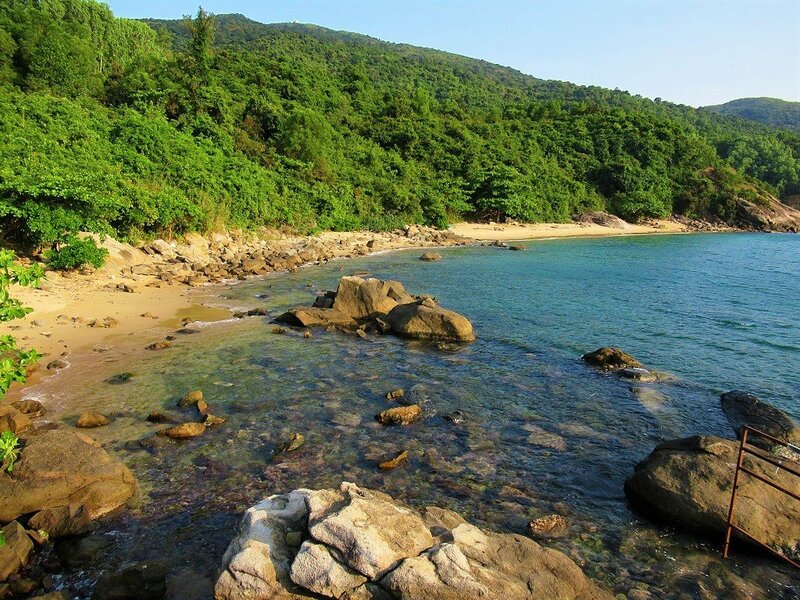 Along the road is a very steep and rocky pathway down to Bai Da, a dramatic, boulder-strewn beach that’s scenic but not great for swimming. Turn right at the ‘Banyan Intersection‘ and continue due east until the road dead ends. This is where The Banyan Tree is located (or ‘Banjan Tree’ as it’s written on most maps). 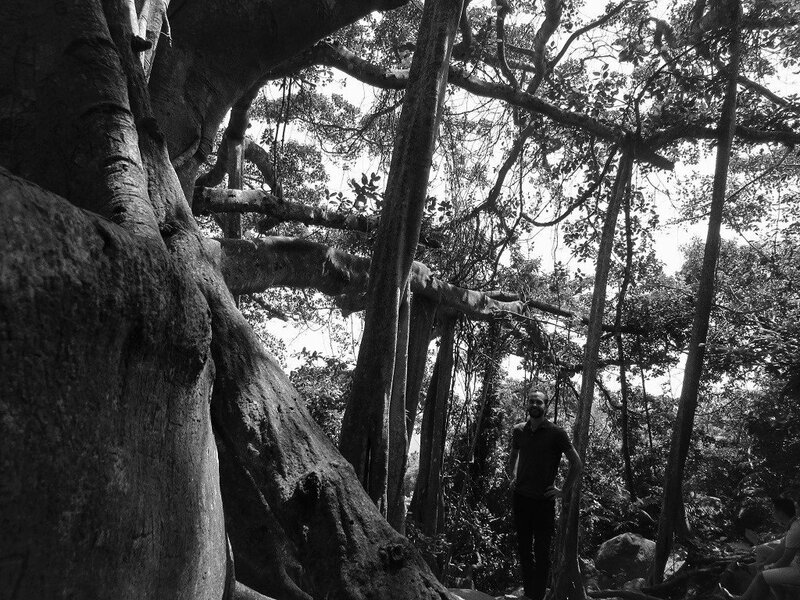 This extraordinary tree is apparently over 800 years old. With dozens of thick, twisted roots, trunks and vines plunging from its canopy to the earth, it looks as though the tree were anchoring itself to the ground so as never to be uprooted or cut down. It’s a beautiful sight. Just think what this banyan tree has seen: the fall of the Hindu-Buddhist kingdom of Champa; the rise of the Vietnamese as they pushed south into what is now central Vietnam; the arrival of Arab, Chinese and Japanese merchants on wooden junks; the first Europeans – the Portuguese, the Dutch, the Spanish, the English – and, of course, the French as they landed in Danang in 1858 to begin what would become their most profitable colony in ‘Indochina’; and then the long wars for independence throughout the 20th century. Through all this, the banyan has stood, and continues to stand, on this green, rugged and breezy peninsular, looking out to sea at the comings and goings of peoples, civilizations, and empires. Back at the ‘Banyan Intersection‘ you can take the lane heading due north. This leads to the most remote part of the peninsular. At a fork in the road, turn left for a mysterious, overgrown lane leading to a dead end (but there are some good views from it). However, if you continue straight at the fork you’ll reach the entrance on your right for Tien Sa Lighthouse. A very steep lane leads down to the picturesque lighthouse. 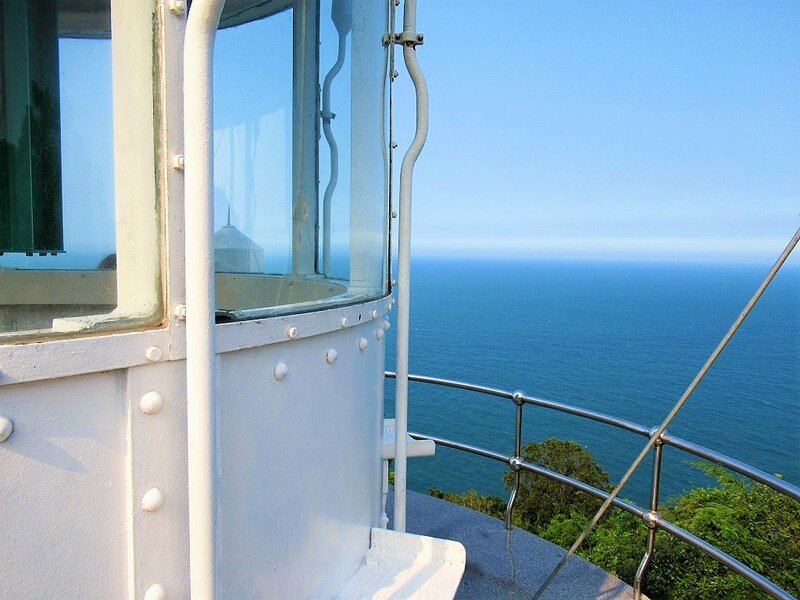 Built during French colonial times, in the early 1900s, the lighthouse is small but perfectly formed. For 20,000vnd you can climb the tight spiral stairs up to the top and open a small, concealed door to crawl out onto the deck. The views are good and there’s an appealing sense of isolation here. A bit further along the road, almost opposite the access lane to the lighthouse, is the entrance to Nhat Lam Thuy Trang eco area. A long lane leads through orchid nurseries, ponds, and a wonderful stand of old-growth forest. 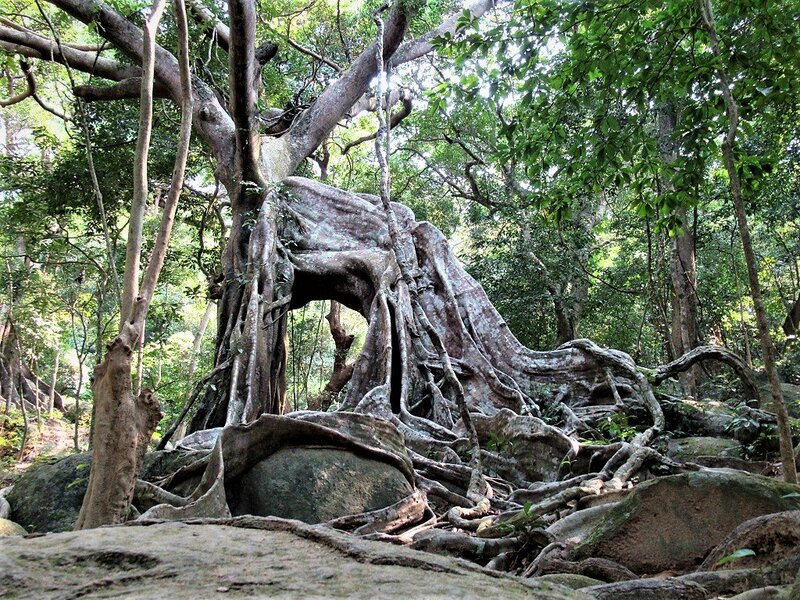 Rutted pathways lead to a couple of huge old banyan trees, their roots tangled and curled around boulders, forming arches and valleys in their trunks. 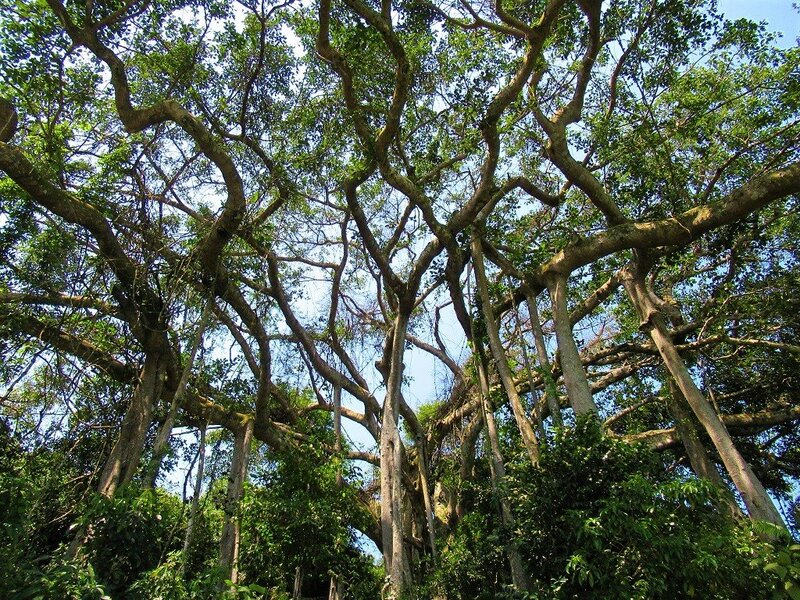 The most famous tree here is Cây Đa Con Nai (Deer Banyan), so named because its shape resembles a deer. It’s well worth the 10-minute hike through the jungle to get here. There’s a real atmosphere under the canopy, with the breeze through the leaves, and the fresh, peninsular air. If you like it that much, you can rent one of the wooden gazebos over the pond for a night of camping: 500,000vnd. After Nhat Lam Thuy Trang eco area, the paved road continues for a few minutes, leading around a cape with views across to the Intercontinental Resort, before dead-ending.